It is good to have a manual with you for torque settings and detailed information on the individual jobs you will undertake. Work methodically around the engine removing bolts and wires, label anything you don't know or may confuse you if you forget. 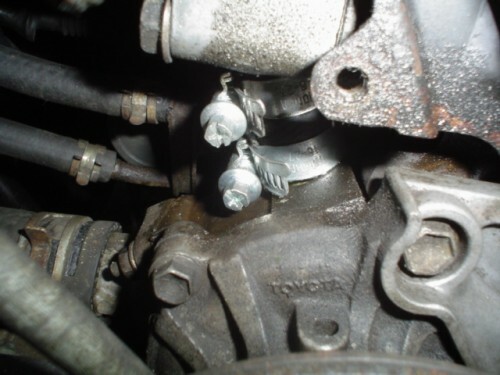 It is the lower 17mm nut on the engine mount, which needs to be removed (the hidden one which is awkward to access) this needs to be undone not the top one! I removed the sandwich plate behind the oil filter because it is easier to access than the oil line (to the oil cooler) and is the same as the one on 7AFE wrap in a plastic bag and check the seal has not fallen off the back. Use two nuts locked against each other to remove studs then return them finger tight to their original holes. Transfer the water pump and all its pipe work it should all come off 4AGE as one piece with three 12mm (15nm) bolts on the front of the block, use the seal from the 7AFE pump as it is probably a bit newer, clean the mating faces. The pipe support bracket on the side of the engine block cannot be used I just left it as it seemed secure enough you could make a simple bracket to hold it. 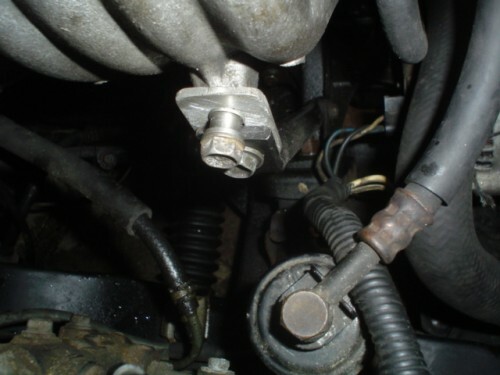 The water pump to head pipe needs to be extended, just cut it in half put the 3/4inch hose over, you only need about 5cm and clamp with two jubilee clips. Run through these with a thread tap!!! If you don't what will happen tome will happen to you! I used a different bolt, which just sheared off in my block because it was not intended for that much torque and the thread was too stiff!! Long! Transfer all the studs and fit the engine mount and alternator bracket, the lower gearbox mounts can no longer be used as they don't line up chuck them away. Run through these with a thread tap!!! If you don't what will happen to me will happen to you! I used a different bolt, which just sheared off in my block because it was not intended for that much torque and the thread was too stiff!! Long! 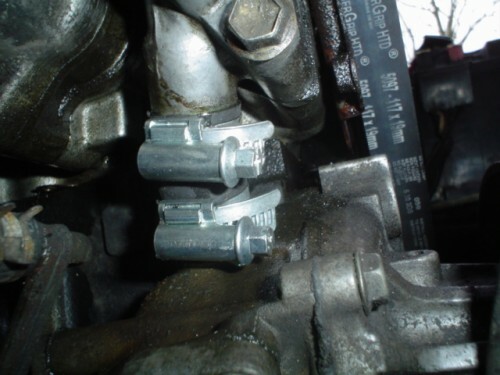 Change injectors take care not to damage the fragile seals, in fact you should replace upper and lower seals as they are probably very worn out! When I replaced my injector lower seals I thought the guy gave me the wrong part it looked so different to the deformed old thing I took out! ps it doesnt like being reved over 7k and power drops off at about 6700 so this is where i have set my shift light, it pulls hard untill then. If anyone has any questions or queries post them and I will try and edit this post to incorporate the answers! after 300+ miles now the engine hasnt blown up so im pretty chuffed, and after much testing against a close friend last night i can safley say the engine has lost no pace despite the reduced redline and changing gear early, (this was a fear of mine because there is normally always a trade off) the new torque band just pulls it through the gears, i never thought id say this but torque really is very exciting too on the street adding a whole new dimension to the corolla! ps values used were mainly found on club 4age and cannot be varified i have tried to be acurate please point out any mistakes you find in my working! I also like sportmaxx and incorrectly placed/applied hangrings. -Injectors: Do not buy the injectors listed in this article. In Robo86's case, we put the car on the dyno, and standard bigport 4AGE injectors flowed more than enough fuel on a standard 4AGE computer etc. Infact it was still running a bit on the rich side. finally stock cams of blue top. So does the 4ac flywheel fit on any 7afe crank ie a ae93 ? 自動車変質者 - Just about sums me up!!! yes it does. both are 6 bolt. Thats cool I didn't really look when I did my 4ac - 4age swap if its as easy as it says might give it a go cos iv got most of it sitting there, but one more question if I may can I use 20mm hole 4age pistons? Yep, 7A pistons/rods are 20mm. from what my conversion has taught me in this article it dosnt mention the spigot bearing witch could spell trouble if you forget it. 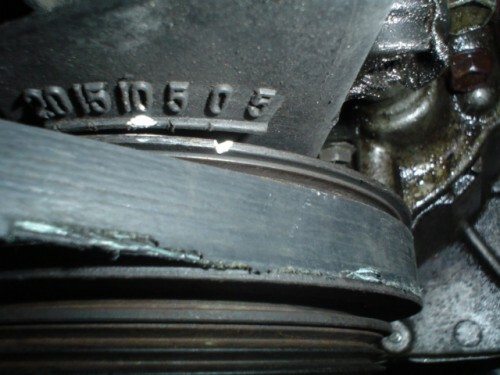 70XIN what was the cost of the Porsche timing belt do you remember? With regards to the hose clamped over the bypass pipe, couldn't you just use a rwd 4ac one? They are longer than the rwd 4age (like 5-10mm from memory). Last edited by Nikkojoe; 7th December 2010 at 02:43 PM.